The next few years are not going to be pretty. We’re looking right into the teeth of a rolling global deleveraging recession—the End Game, I’ve called it. And the decisions we make in the next couple years about how to handle our debts and budget deficits—here in the U.S., in Europe, in China and Japan, and elsewhere—are going to be absolutely crucial. My daughter Abbi is coming into town tonight from Tulsa with her fiancé, and most of the family will gather over the weekend for dinners and fun. And her twin Amanda is expecting, so another grandchild is in the future as well. Family and friends are among the few permanent fixtures in a world that seems to change almost weekly. I was with Pat Cox of Breakthrough Technology Alert on Tuesday night. We watched the debate and then went deep into the night talking about the future. And got up the next day and did the same between meetings. We ended up doing a tag team that night for Hedge Fund Cares, which raised a lot of money to help abused children. I talked about the global landscape (which was not so upbeat) and he talked about the changes we see in the biotech world; and we then both answered questions, which was more fun, as we got to think about the marvelous the future that is shaping up. Such totally amazing things are happening. I am really quite the optimist over the longer term. Have a great weekend, and look for your next Thoughts from the Frontline in your inbox Monday. Commodity markets have risen in reaction to the Federal Reserve’s liquidity injections into the banking sector (Table 1). From the time the press reported that the Fed was moving toward QE1 & QE2 commodity prices surged. During QE1 & QE2 wholesale gasoline prices jumped 30% and 37%, respectively, and the Goldman Sachs Commodity Food Index (GSCI-Food) rose 7% and 22%, respectively. From the time the press reported that the Fed was moving toward QE3, both gasoline and the GSCI Food index jumped by 19%, through the end of the 3rd quarter. The unintended consequence of these Federal Reserve actions, however, is to actually slow economic activity. 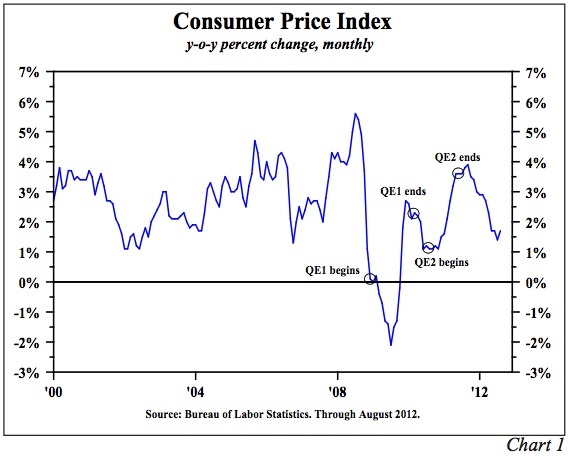 The CPI rose significantly in QE1 and QE2 (Chart 1). These price increases had a devastating effect on worker’s incomes (Chart 2). Wages did not immediately respond to commodity price changes; therefore, there was an approximate 3% decline in real average hourly earnings in both instances. It is true that stock prices also rose along with commodity prices (S&P plus 36% and 24%, respectively, in QE1 and QE2). However, median households hold a small portion of equities, and thus received minimal wealth benefit. Despite the miserable economic results in QE1 and QE2, we now have QE3. Fed Chair Ben Bernanke and other Fed advocates believe the “wealth effect” of QE3 will bring life to the economy. The economics profession has explored this issue in detail. Sydney Ludvigson and Charles Steindel in How Important is the Stock Market Effect on Consumption in the FRBNY Economic Policy Review, July 1999 write: “We find, as expected, a positive connection between aggregate wealth changes and aggregate spending. Spending growth in recent years has surely been augmented by market gains, but the effect is found to be rather unstable and hard to pin down. The contemporaneous response of consumption growth to an unexpected change in wealth is uncertain, and the response appears very short-lived.” More recently, David Backus, economic professor at New York University found that the wealth effect is not observable, at least for changes in home or equity wealth. A 2011 study in Applied Economic Letters entitled, Financial Wealth Effect: Evidence from Threshold Estimation by Sherif Khalifa, Ousmane Seck and Elwin Tobing found “a threshold income level of almost $130,000, below which the financial wealth effect is insignificant, and above which the effect is 0.004.” This means a $1 rise in wealth would, in time, boost consumption by less than one-half penny. The unintended consequences of QE3 could also serve to worsen and undermine global economic conditions already under considerable duress. When the Fed actions lead to higher food and fuel prices, the shock wave reverberates around the world, with many foreign economies being hit adversely. When prices of basic necessities rise, the greatest burden is on those with the lowest incomes since more of their budget is allocated to the basic necessities such as food and fuel. Thus, a jump in daily essentials has a more profound negative impact on living standards in economies with lower levels of real per capita income. Can the Fed Create Demand? Can all the trillions of dollars of reserves being added to the banking system move the economy forward enough to eventually create a higher level of aggregate spending? Our analysis of the aggregate demand curve and its determinants indicate they cannot. 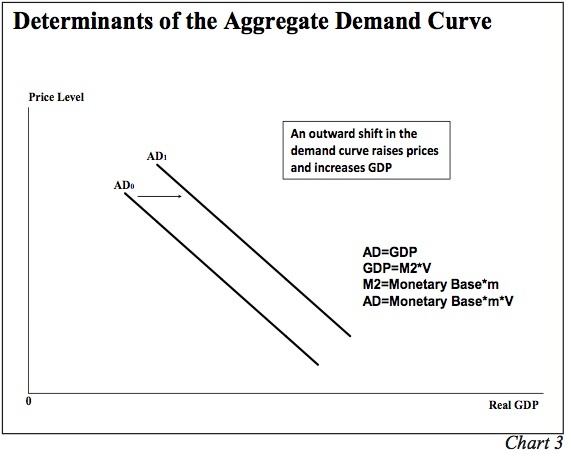 The question is whether monetary actions can shift this aggregate demand (AD) curve out to the right from AD0 to AD1 (Chart 3). If this were possible, then indeed the economy would shift to a higher level of prices and real GDP. The AD curve is equal to planned expenditures for nominal GDP since every point on the curve is equal to the aggregate price level (measured on the vertical axis of the graph), multiplied by real GDP (measured on the horizontal axis of the graph). We know that GDP is equal to money times its turnover or velocity, which is called the equation of exchange as developed by Irving Fisher (Nominal GDP = M*V). Deconstructing this formula, M (or M2) is comprised of the monetary base (currency plus reserves) times the money multiplier (m). The Federal Reserve has control over the monetary base since its balance sheet is the dominant component of the monetary base. However, the Fed does not directly control the money supply. The decisions of the depository institutions and the non-bank public determine the money multiplier (m). 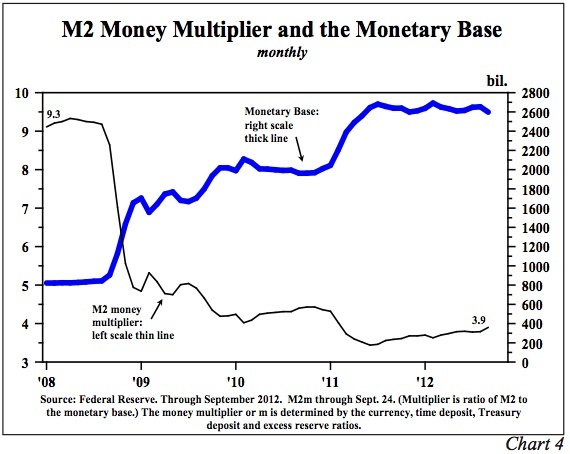 M2 thus equals the monetary base multiplied by the money multiplier. The monetary base, also referred to as high powered money, has exploded from $800 billion in 2008, to $2.6 trillion currently, but the money multiplier has collapsed from 9.3 to 3.9 (Chart 4). Therefore, the money supply has risen significantly less than the increase in the Fed’s balance sheet, with the result that neither rapid gains in real GDP nor inflation were achieved. Indeed, with the exception of transitory episodes, inflation re mains subdued and the gain in GDP in the three years of this expansion was the worst of any recovery period since World War II. The other element that is required for the Fed to shift the aggregate demand curve outward is the velocity or turnover of money over which they also have no control. During all of the Fed actions since 2008 the velocity of money has plummeted and now stands at a five decade low (Chart 5). 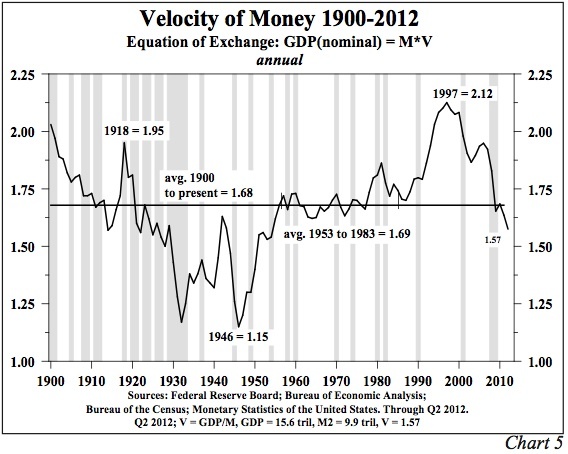 The consequence of the Fed’s lack of control over the money multiplier and velocity is apparent. The monetary base has surged 3.3 times in size since QE1. Nominal GDP, however, has grown only at an annual rate of 3%. This suggests they have not been able to shift the aggregate demand curve outward. 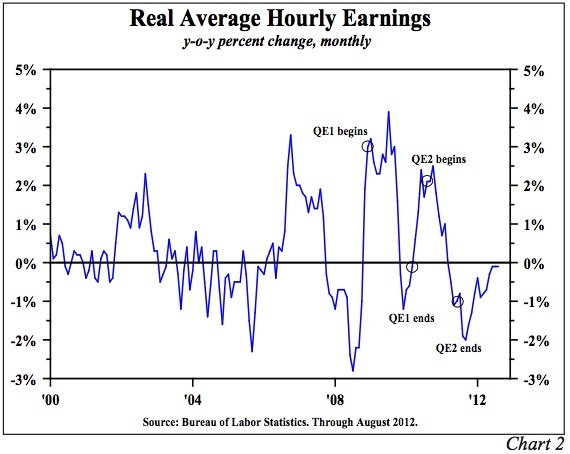 Nor, with these constraints, will they be any more successful in shifting that curve under the present open-ended QE3. Increased aggregate demand and thus rising inflation is not on the horizon. As commodity prices rose initially in all the QE programs, long-term Treasury bond yields also increased. However, those higher yields eventually reversed and generally continued to ratchet downward, reaching near record lows. The current Fed actions may be politically necessary due to numerous demands for them to act to improve the clearly depressed state of economic conditions. However, these policies will prove to be unproductive. Economic fundamentals will not improve until the extreme over-indebtedness of the U.S. economy is addressed, and this is in the realm of fiscal, not monetary policy. It would be more beneficial for the Fed to sit on the sidelines and try to put pressure on the fiscal authorities to take badly needed actions rather than do additional harm. Until the excessive debt issues are addressed, the multi-year trend in inflation, and thus the long Treasury bond yields will remain downward. 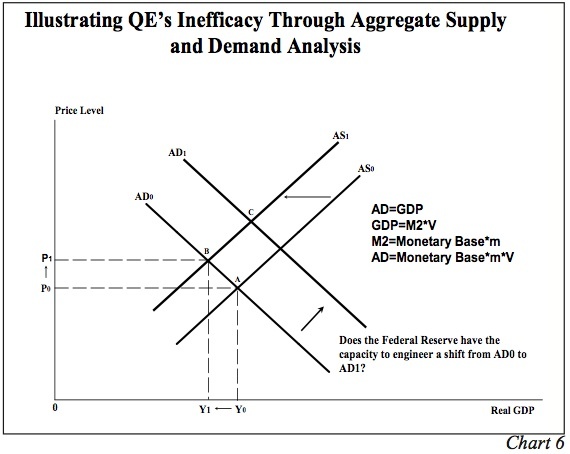 One of the most important concepts in macroeconomics is aggregate demand (AD) and aggregate supply (AS) analysis – a highly attractive approach that is neither Keynesian, monetarist, Austrian, nor any other individual school, but can be used to illustrate all of their main propositions. However, before detailing the broader macroeconomics associated with the movement of the AD and AS curves, it is important to understand microeconomic supply and demand curves. This can best be illustrated through the recent impact the Fed’s decisions had on commodity prices. In the commodity market, like individual markets in general, the demand curve is downward sloping, the supply curve is upward sloping, and where they intersect determines the price of the commodity and the quantity supplied/demanded. The micro-demand curve slopes downward because as the price of an item rises, the quantity demanded falls due to income and substitution effects ( buyers can shift to a substitute product). The micro-supply curve slopes upward since producers will sell more at higher prices than lower ones. Both supply and demand schedules are influenced by expectation, fundamental, and liquidity considerations. 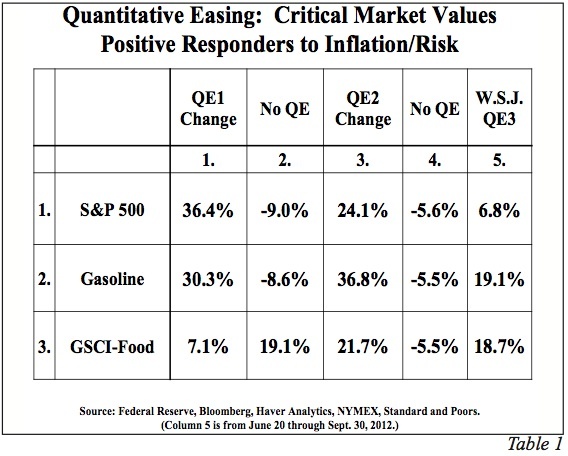 When the Fed says that they want faster inflation and that they are going to take steps to achieve this objective, both economic theory and historical experiences indicate that commodity prices will rise, at least transitorily (as seen with the surge in commodity prices after the announcement of QE1, QE2 and QE3). Information and liquidity available to the buyers is also available to the suppliers, so by saying faster inflation is ahead, suppliers are encouraged to reduce or withhold current production or inventories, moving the supply curve inward. Thus, in the commodity market, the Fed action spurs an outward shift in the micro-demand curve along with an inward shift of the micro-supply curve, producing higher prices and lower quantities. These microeconomic developments transmit to the broader economy, which we will now trace through A D and AS curves. The AD curve slopes downward and indicates the amount of real GDP that would be purchased at each aggregate price level (Chart 6). Aggregate demand varies inversely with the price level, so if the price level moves upward from P0 to P1, real GDP declines from Y0 to Y1. When the price level rises, real wages, real money balances and net exports worsen, thereby reducing real GDP. The rationale for the downward sloping AD curve is thus quite different from the sloping of the micro-demand curve since substitution effects are not possible when dealing with aggregate prices. In order to improve real GDP with a rising price level, the AD curve would need to be shifted outward and to the right (from AD0 to AD1). And as detailed in the letter, the Fed is not capable of shifting the entire AD curve. The AS curve slopes upward and indicates the quantity of GDP supplied at various price levels. The positive correlation between price and output in micro and macroeconomics is the same since the AS curve is the sum of all supply curves across all individual markets. When Fed policy announcements shock commodity markets, the AS curve shifts inward and to the left (from AS0 to AS1). This immediately causes a reduction in real GDP (the difference between Y0 and Y1) as the price increases by the difference between P0 and P1 (also Chart 6). Furthermore, as discussed in the letter, lower GDP as a result of higher prices reduces the demand for labor and widens the output gap, setting in motion a negative spiral. For Fed policy to improve real GDP, actions must be taken that either (1) shift the entire demand curve outward (to the right), or (2) do not cause an inward shift of the AS curve that induces an adverse movement along the AD curve. Accordingly, the Fed is without options to improve the pace of economic activity. Like Outside the Box? Then we think you’ll love John’s premium product,Over My Shoulder. Each week John Mauldin sends his Over My Shouldersubscribers the most interesting items that he personally cherry picks from the dozens of books, reports, and articles he reads each week as part of his research.